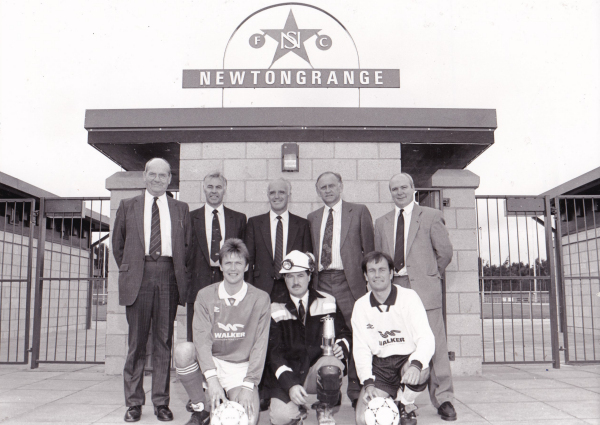 NEWTONGRANGE Star moved into their new home at the weekend – marking the start of a new era in the club's history. Redwood Bing, which once stood in sad testimony to the demise of the area's coal industry, is now the site of a £1.25m football stadium and a new focal point for the former mining community. The Star, who beat Ayrshire team Auchinleck Talbot 2-0 in Saturday's gala match to mark the opening of the new facilities, are now optimistic of a bright and successful future at New Victoria Park. 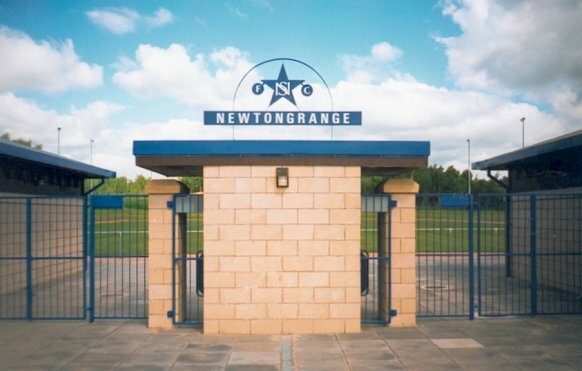 Speaking at the opening of the stadium on Friday, club secretary Gregor Dorans said Newtongrange Star would be the envy of every junior club in Scotland, with the best facilities in the country. "When players come up here and see the facilities on offer, we will have no difficulty in signing new players. We can now be confident of bringing the Scottish Junior Cup to Newtongrange, which has eluded us for 70 years," he said. 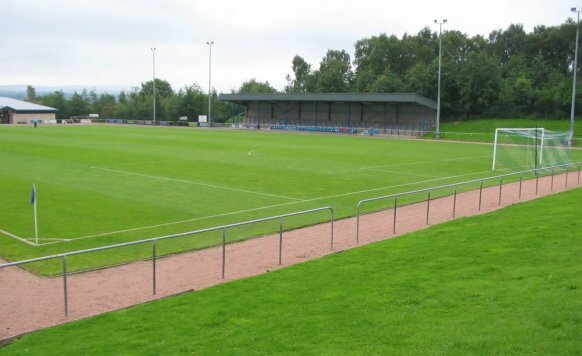 "The members of Newtongrange Star who have had the foresight to go ahead with this project have once again put the Star in the forefront of Scottish junior football." 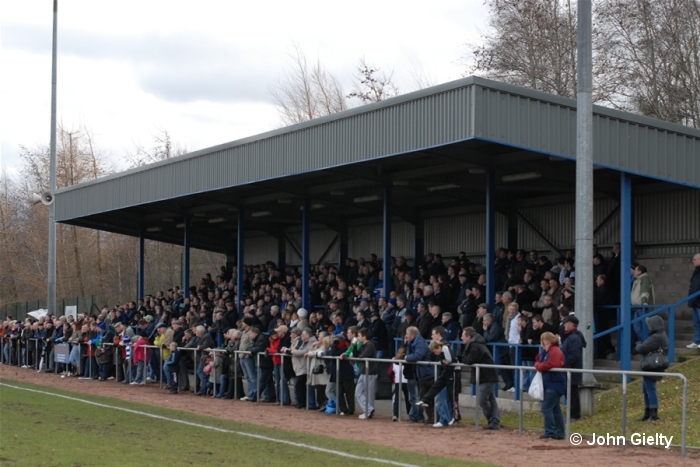 The 5000-capacity stadium – complete with pavilion, covered enclosure and social club – was built by the Walker Group (Scotland) in return for the club's old Victoria Park ground, which is now being developed for housing. 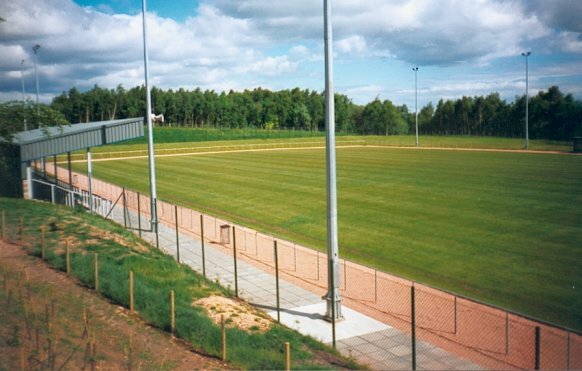 The project was carried out in partnership with Lothian and Edinburgh Enterprise Limited who cleared the bing to create the playing surface and grassed spectator slopes, landscaped the surrounding area and created access from Dalhousie Road. LEEL Chairman Bob Maiden, also speaking on Friday, hailed the development as a "superb amenity" for the entire community. He said the stadium was a reflection of the growing confidence in Newtongrange as a village with a future and a major step forward in the regeneration of the village. Walker Group Chairman Mike Walker said this was the latest in a number of positive changes which had taken place in Newtongrange over the past 12 years, and a proud day for the village. Mr Walker thanked LEEL for its help in bringing the project to fruition and paid tribute to Midlothian District Council and Lothian Regional Council for their assistance. 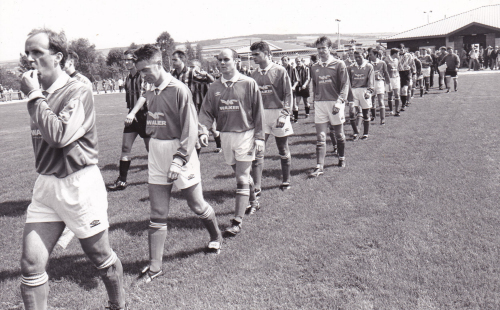 Midlothian MP Eric Clarke, a guest at the inaugural match, also wished the club well for the future. "Newtongrange Star Football Club should be proud of these new facilities and I hope they augur continued success on the playing field," he said. "With the support of the village behind them, the future is not in the stars but firmly with the Star." 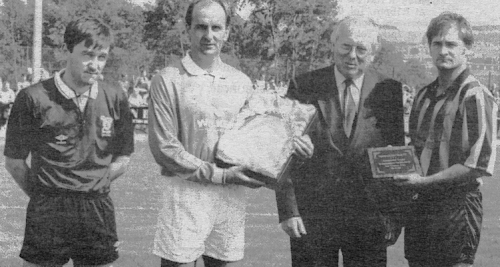 Presentation involving referee Alan Gemmell, Star captain Kevin McColl, Midlothian MP Eric Clarke & Auchinleck captain Tom MacDonald. 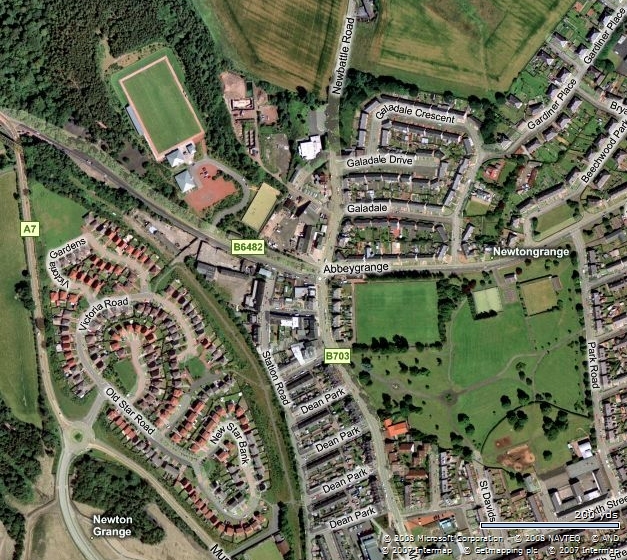 This satellite image shows the location of New Victoria Park in the north west. The former site of Victoria Park is now a housing area with street names such as Old Star Road and Victoria Gardens. Regional Councillor Joe Peacock, Walker Group Chairman Mike Walker, LEEL Chairman Bob Maiden, District Councillor Jim Green and District Vice-Convener George Purcell pictured at the turnstiles with Star player Paul Ramsay, committee member Frank Sullivan and Star player Mark Ballantyne. Newtongrange Star v Cumnock Juniors.